Don Jones, agriculture educator at Harrison Central coaches Riley Eberhart, sophomore, in public speaking. 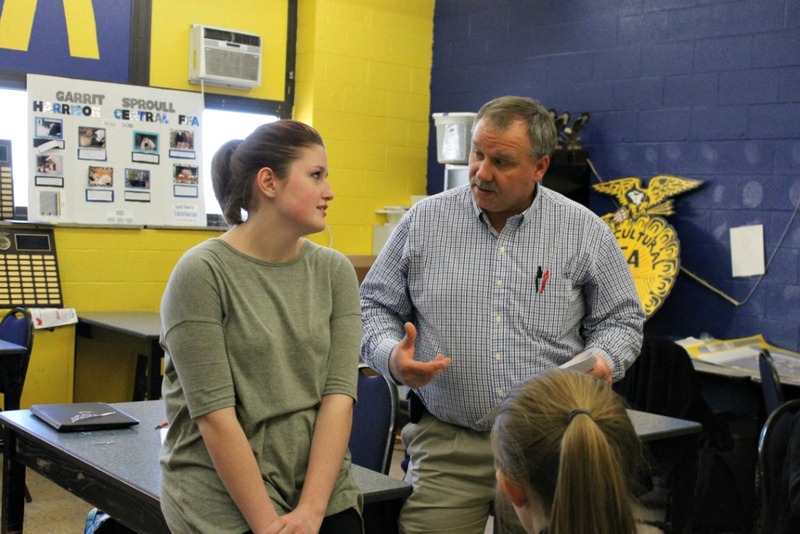 CADIZ, Ohio — Don Jones supports students as an FFA adviser, represented by the owl during FFA meetings. In his classroom at Harrison Central Junior and Senior High School, he provides real lessons for real life as the agricultural education teacher. He sees 140 students a day, in grades 7-12. Being the only educator in the program, with just one classroom, he has to turn away students from his program, which is an elective for the nearly 650 youth at Harrison Central. After graduating from Cadiz High School, Jones and his twin brother, John, both went to Ashland University majoring in special education and on scholarships to wrestle. Once they graduated, John went into teaching special education and Don got a job as a long-term sub teaching agriculture at the Harrison Career Center. He then took two more years of schooling to get certified to teach agriculture and took a full-time position at the career center. Staying in the county, he moved to Lakeland High School and taught there until 1999 when three schools merged — Cadiz High School, Jewett-Scio High School and Freeport Lakeland High School — forming Harrison Central. Click the logo for more FFA news! His twin eventually also got certified to teach agriculture, as well, and taught at Union Local for many years until recently switching careers to run the family business, D & J Sales and Service, a farm equipment dealership. 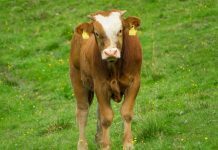 Jones teaches agricultural education based on a three-circle model: FFA, supervised agricultural experiences and classroom instruction. Don Jones with with members of the FFA Agricultural Sales CDE team as they prepare for the district contest. Jones has only a classroom, which seats about 26 students, and a detached greenhouse. He doesn’t have a shop or extra space to do hands-on projects like many similar programs. Harrison Central has passed a levy to build a new school, and Jones said current plans for the new school include a shop space for the program. Until then, they will make do, he said. Jones’ program puts an emphasis on animal science curriculum, as 60 percent of the students have an animal background. 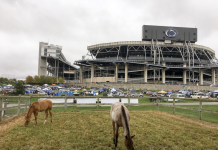 Nearly 90 percent of his students focus on an animal-related supervised agricultural experience (SAE) and take market livestock projects to the county fair, he said. For most of his students, their fair projects double as their SAE and they learn to keep records and care for the animals in the classroom. Each student has his own Chromebook, and the classes no longer use textbooks, but an online curriculum. This can be distracting to Jones, but he has learned to adjust to the screens and make good use of the technology, he said. “Students these days have a lot of knowledge, but lack in experiences. 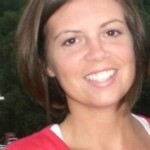 It is important that I offer those experiences where they can try their knowledge in a safe environment,” said Jones. For many, that safe environment is FFA. And when it comes to FFA competitions, Jones focuses on what is going to benefit his students down the road — what smoothly transitions from classroom curriculum to FFA contests to real life. Harrison Central FFA is active at the district, state and national level. Jones, FFA adviser, helps his students apply what is learned into the classroom to FFA competitions and overall career success. “What skills can they gain in their interest areas to make them career and college ready? I take that into consideration when we decide what FFA contests they will get involved in,” he said. Riley Eberhart, a sophomore in Jones’ program, is active in extemporaneous speaking contest. “I like public speaking because it has taught me how to speak to adults clearly and efficiently and get my point across. 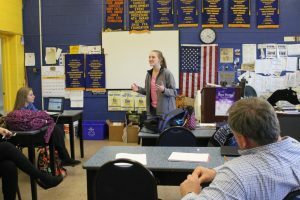 In this class, we don’t just learn about agriculture, we learn how to grow ourselves, learn life lessons, like how to get to college,” said Eberhart. She wants to be an lawyer to defend agricultural rights. 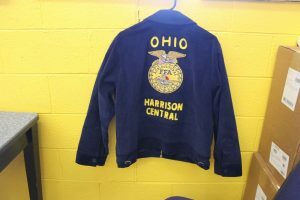 The Harrison Central FFA program is active at the district and state level, with teams and individuals competing at the state level annually. MacKenzie Jurosko, sophomore, has experienced success in the prepared public speaking contest, winning the sub-district and district contest last year and competing at state. She lives on a hobby farm and wants to be veterinarian specializing in equine. She is also on Harrison Central’s parliamentary procedure team. “Mr. Jones has taught me to think through issues and has helped me learn about college options,” she said. He has had one state officer and one national proficiency winner during his tenure. Each year, the chapter goes to the National FFA Convention & Expo, taking 15 to 20 students. He admits that having a great wife, who understands the job and the time commitment is a big factor to his success. His wife, Amy, teaches fifth grade language arts at Harrison East in Hopedale, Ohio, which is part of the same district. They have two daughters; Jalyn is a senior and Emi is a freshman at Harrison Central. He gets his motivation from seeing his biological children and all his “kids” achieve success. The chapter’s main fundraiser is the fruit sale where they sell $55,000-$65,000 worth of fruit annually. 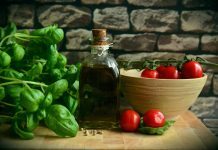 The chapter makes 35 to 40 percent of that in profit, he said. The funds help the students travel to national FFA convention, the National Farm Machinery Show, leadership conferences and other opportunities. Their other major fundraiser is the student services auction at the annual FFA banquet. During this auction, community members bid on one FFA member who will provide eight hours of service. 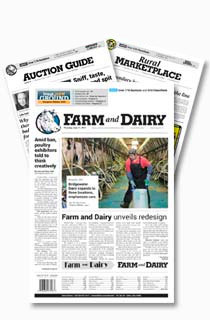 This auction usually brings in $4,500-$5,000 and will pay for the costs of the banquet. Jones also credits the success of the program to the alumni chapter. FFA advisor Don Jones listens as sophomore FFA member, MacKenzie Jurosko recites a speech. The chapter also gets support from the Harrison County Farm Bureau. Each year they host a chicken barbecue for the FFA members and their parents and bring in a keynote speaker. Jones’ service to the community doesn’t stop in serving the students. He is also the Harrison County Fair board president; a member of the Harrison Soil and Water Conservation District, serving on the board for nine years; the Harrison County Farm Bureau board; and the South Central Power Foundation as chairman. The Jones family also attends the Minksville Church of Christ, where he has been a member 23 years. As a teacher, coach and mentor, Jones focuses on student potential. And just as Jones encourages his students to provide the meat and potatoes at the beginning of a speech, he works to provide his students with the meat and potatoes of life, preparing them for success. What an absolutely GREAT GUY!